Along with teaching our children to recognise letters and numbers, getting them to know their colours is a really important part of their learning. But have you ever thought that labelling colours with a name is limiting? 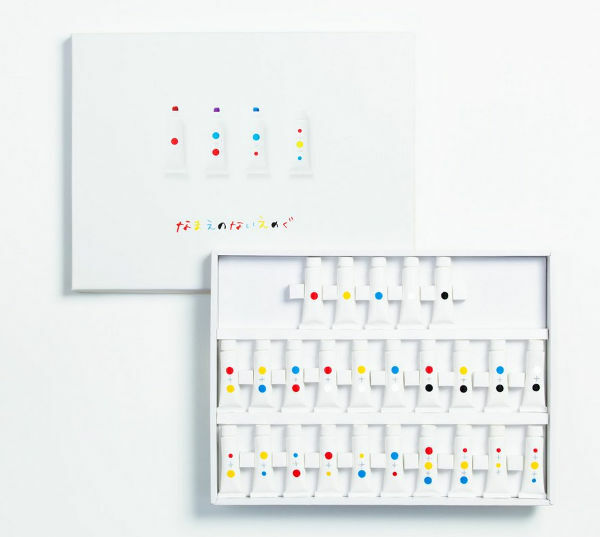 This insightful Japanese design duo has taken a step back, and created nameless paints – in a bid to expand the minds of children. The No Name Paint Set is rather beautiful in its simplicity, as is the way with many Japanese-designed products. The colours are simply identified by small circles, that depict which colours have been mixed to come up with the paint in the tube. “By not assigning names to the colours we want to expand the definition of what a colour can be, and the various shades they can create by mixing them,” Yusuke Imai, one half of the design team Ima Moteki, tells Spoon & Tamago. If you look carefully at the tubes, you’ll notice some circles of colour are larger than others. That’s to show the proportions of each paint that were used to make the final colour. This label-less way of thinking is aimed at giving kids a chance to understand colour, rather just associate it with a name. The paint set is due to hit the market through Campus stationary products this month.